ETHNIC FEELING- Adds a rich, pleasing and an ethnic feel to ceiling or wall of your room, dining, drawing hall or your bed. It's a part of proud Indian Traditional culture. 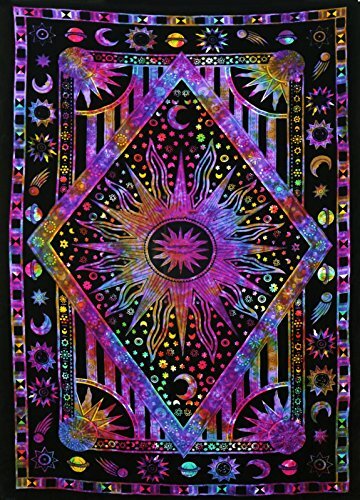 These Tapestries are conversational piece of art. MADE IN INDIA- 100% Cotton, made & printed in India. Size - 84X 52 Inches. Color- Multi, Design- Celestial Tie Dye Burning Sun. A wonderful example of Indian craftsmanship.